Warning lights on emergency services vehicles provide an essential safety function by warning road users of a hazard ahead, along with the need to move out of the way giving priority to the emergency vehicle, allowing for a safe and rapid response to an incident. Sadly however, for some the fitting of warning lights is seen as just another expense, and in the current climate the temptation can be to buy the cheapest available product that “ticks the box”. Such a short sighted approach however can jeopardise safety and result in the fitting of poor performance, unreliable, high maintenance products, resulting in a much higher lifetime cost than might first appear. The small size of LED lightsources enables precision optical control of scene lighting even in compact housings. light source life is limited and strobe technology is also power hungry. The final and increasingly popular alternative is to use LED technology. LED’s can be used to produce light in a range of different colours including white and blue and red. The crucial benefit of LED technology is working life, latest generation LED technology offers a life of typically 50,000 hours – many times that of a halogen source, allowing maintenance intervals of many years instead of a few months. LED’s can be switched on and off at high speed without affecting life, allowing silent operation with a choice of flash patterns. Current generation LEDs can produce many times more light than older generation products and can have a considerably longer life. However, both light output and LED life are very much dependant on the quality of drive circuitry and the thermal management of the LED chips. Warning lights are often used in hot environments and in particular can be exposed to sunlight for long periods. To ensure a long and trouble free life, quality of design is essential. A good way to evaluate the quality of an LED product is to consider the length of warranty offered. Haztec for example offer product warranties of up to 5 years – demonstrating complete confidence in product design and component selection. The compact nature of LED lights means they can be much less obtrusive than previously possible, Directional warning lights are now available with depths of as little as 10mm so lights no longer require semi recess or recess mounting in order to avoid bulky protrusions. Latest LED modules can offer dual colour output without compromising on intensity. EC65 is a European third party approval process that is designed to ensure that visual warning devices are fit for purpose. To gain approval, products are tested by a certified independent test house to verify that the light output is within tightly controlled maximum and minimum limits over a wide range of viewing angles. The standard also verifies that flash frequencies are correct. In addition, EC65 also includes demanding environmental tests to ensure adequate ingress protection along with tests to ensure that the light output falls in the correct part of the colour spectrum. EC65 approval is mandatory in the majority of European countries and is highly recommended in the rest. Outside of Europe other standards may be required or potentially none at all. In the absence of a required standard, EC65 approval can be specified with confidence knowing that the resulting product will be well designed and fit for purpose. Another advantage of LED technology over halogen and strobe alternatives is that it generates coloured light rather than generating a white light and relying on coloured lenses to produce the desired final light colour. With LED technology the required light colour can be generated from the outset, enabling clear lenses to be used. – typically red, green and blue all mounted together on a single tiny chip. By controlling the relative power output of each individual colour it is possible to “mix” the colours in differing proportions and produce a simulation of any colour in the spectrum. Whist ideally suited for many applications, this technique has not generally been suitable for emergency warning lighting use. These multicolour chips are not generally able to produce sufficient light intensity for effective warning. However LED technology has moved on and some specialist LED chip manufacturers now produce high power LEDs with 2 separate on board chips allowing 2 dedicated colours to be produced. These chips allow one or the other colour to operate at full power producing a suitably intense output of a fixed light colour – effectively 2 different LEDs but importantly sharing a common optic and maintaining sufficient light intensity for effective warning. As an example of this technology, Haztec recently developed the XED module range, these modules have dual colour output and have been independently certified to EC65 class 2 (the most demanding level of performance within EC65) in both blue and amber. This allows a single lightbar to be set to operate with either a blue or amber light output which can be changed at any time using a single button on the dashboard. Whichever colour mode is selected the entire lightbar operates at the desired colour. Other applications for multi colour technology include having lights change colour depending on circumstances, for example on a lightbar, when the vehicle is travelling all lights can flash say blue for maximum warning impact, but when the vehicle reaches the incident, some lights can change colour and flash red. LED technology allows Lightbars to be much lower profile whilst still having room for Auxilliary equipment such as siren speakers. Scene light applications that demand high light levels previously required the use of large halogen light sources or discharge lights, neither of which are ideal for vehicle based applications. Halogen lights are power hungry, relatively inefficient and have a relatively short working life. Discharge lighting is much more efficient but can suffer from long warm up times and difficulty with efficient optical control. Good quality LED’s are more efficient than halogen producing more light whilst consuming less power. 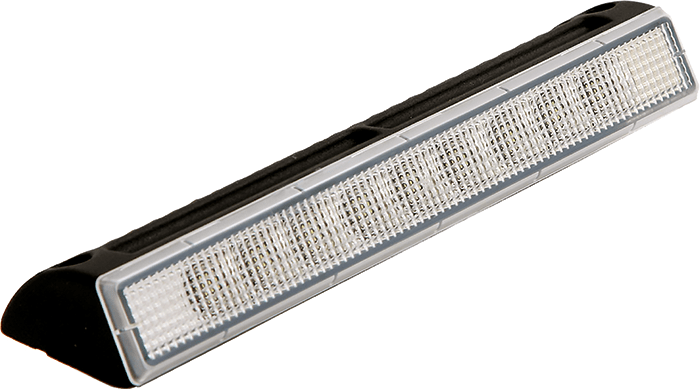 In addition LED’s operate over a wide temperature range and illuminate instantly – even in very low ambient temperatures. These benefits, coupled with long life and rugged design is increasingly making LED technology the preferred choice for vehicle interior lighting and scene lighting as well. Over recent years advances in thermal management have allowed the use of high power LEDs giving very high light outputs, LED scene lighting can now provide lighting levels that could previously only be achieved with discharge lighting. Providing the Light is well designed with stable LED temperatures, LED lighting can offer a very efficient compact long life reliable light source. Another major benefit of LED lighting is that the LED is a very small light source with a very directional light output. This makes it comparatively easy to control and direct the light output. Lights can be designed to have short range, wide angle beams, long range focussed beams or even combination beams offering both wide angle and long range components. Scene lights mounted on the sides of vehicles can have very precise optical control directing light downward and outwards covering the area immediately surrounding the vehicle but without causing glare or wasting valuable light. LED technology is being increasingly used in numerous different applications on modern vehicles, this is being driven by the combination of long life, silent operation, low power consumption and slimline design. Whilst it is true that LED technology has a higher initial cost, the long term maintenance and energy benefits of LED are making it an increasingly popular choice for many vehicle applications. Furthermore LED technology continues to evolve creating new possibilities for warning and scene lighting. Peter Cook is the Sales and Marketing Director for Haztec International Limited.